A Chinese-Australian woman subjected to a slew of racial abuse on a Sydney bus on Wednesday pleaded for help from the driver but says no one came to her aid. Lindsay Li was waiting in Willoughby for the citybound 273 bus at lunchtime on Wednesday when she says an older woman came up to her, spat on her and struck her with her shopping trolley, before pushing ahead of her to get on to the bus when it pulled up. When the woman reeled around on the bus and began throwing racist insults at Ms Li, the younger woman pulled out her phone and began filming. The woman was “screaming in a racial tirade, just calling me every name under the sun,” Ms Li told Fairfax Media. No one intervened, Ms Li said. “I was completely terrified. No one was standing up for me. This woman was so unstable I thought she could physically attack me at any time,” Ms Li said. The woman bears a striking resemblance to woman caught on video shouting racist abuse at a Chinese-Australian couple in a Sydney park in August. This woman hurled abuse at Lindsay Li on the bus. 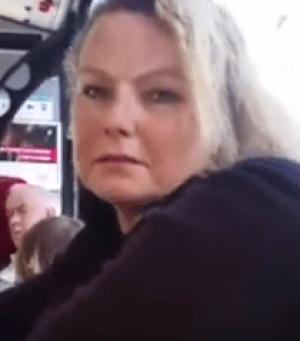 “This woman came up to me at the bus stop and proceeded to spit on me and strike me with her trolley … then just went off at me with her racist tirade!” Ms Li wrote in a comment below the post. In the video, the older woman calls Ms Li a “f—ing ugly f—ing chink” and accuses her of selling drugs. “We all know what you are, China … Take your f—ing language and piss off, f—ing chink,” she says. Ms Li doesn’t respond during the video. “I was just sitting there waiting for the bus, and this woman crosses the road, she approaches me, like she’s seen me as a target,” Ms Li said. When she got off at her usual stop in Crows Nest the older woman followed and continued her screaming rant. Ms Li was so shocked she reported the incident to the police. NSW police police confirmed they had received a report of alleged offensive behaviour on a Sydney bus on Wednesday and the incident was under investigation. “It just makes you lose a little bit more faith in humanity,” Ms Li wrote on her facebook page. State Transit said racism on our buses in any way, shape or form was not condoned, according to a statement from a spokeswoman. “We will be investigating this matter further and if required, will take appropriate action. “State Transit works closely with the Police Transport Command and Police Local Area Commands to reduce instances of antisocial behaviour on our buses. We encourage customers to report acts of racism to NSW Police,” the statement read. A woman with a strikingly similar appearance, accent and voice as the woman in Ms Li’s video made headlines in August when footage emerged of her launching a racist tirade at a Chinese-Australian couple eating lunch in Wynyard Park. The woman accused the couple of “taking all the jobs” and demanded they give up their seat for another Anglo-Saxon woman because they were Asian. Ms Li’s video had been viewed more than 1600 times by Thursday afternoon.